Safety is important for all of us, but the need for a comprehensive safety plan is particularly important for individuals with dementia. Diseases like Alzheimer’s can cause a number of changes in the brain and body that may affect safety. These might include: judgement (forgetting how to use an appliance,) sense of time and place (getting lost in a familiar place,) behavior (becoming easily confused, suspicious or fearful,) and physical ability (having trouble with balance or depth perception.) Below are a few tips that might be helpful. A comprehensive offering of safety information, tips and resources can be found here. Most accidents in the home occur during daily activities such as eating, bathing, and using the restroom. A walk-in shower with grab bars may be easier to navigate than a bathtub. Textured stickers on slippery surfaces may help individuals feel more secure. Consider adjusting the temperature on the water heater so that the water is not so hot that it scalds someone who forgot to turn on the cold water along with the hot. Try to avoid serving food and beverages that are too hot. A person with dementia may not remember to check the temperature. Basic household appliances or household objects can become dangerous. I remember walking into the kitchen in my parents’ house just as my mother finished loading the dishwasher. I watched her add soap and start the machine. Then she flipped the switch for the garbage disposal. When it made a rattling sound (caused by a peach pit) my mother reached into the disposal to see what was causing the noise. If I had not jumped to shut off the disposal, she would have seriously damaged her hand. I suggested to my father that the disposal be disabled or changed so that it could only operate when the drain was covered. Other safety precautions in the kitchen might include: installing a hidden gas valve or circuit breaker by the stove that a person with dementia might turn on and then forget to turn off; store knives, cleaning products, and appliances such as blenders in a safe location; discard toxic plants and decorative fruit that may be mistaken for real food; keep medications in a locked area at all times; monitor food in the refrigerator to make sure spoiled or rotten food is not eaten by mistake. 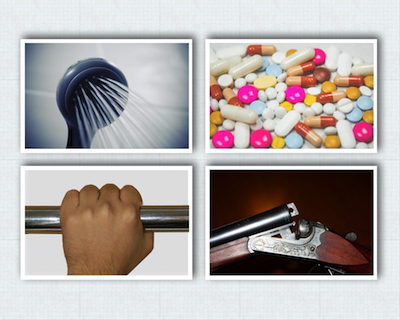 Guns and ammunition are best removed from a home. Someone who loves hunting might still go out into the woods with friends without actually handling a weapon. Even an unloaded weapon can be dangerous. I remember reading about a man who wandered into a 7-11 convenience store with his unloaded rifle. The store clerk immediately notified the police. When the law enforcement officers came, the man with dementia raised the gun and aimed it at the officers without really understanding what he was doing. The officers fired when he did so. People with Alzheimer’s disease often lose their depth perception. This causes dark walk-off mats to appear to be holes and steps can be hard to navigate. Placing brightly colored tape on steps can make them easier to navigate and replacing mats with ones that are brown or lighter color, may be helpful. Also, ensuring that light throughout the house is even and there are no significant glares or shadows can make a house safe. For additional suggestions and for answers to safety questions, readers are encouraged to contact the Alzheimer’s Association through its 24-Hour Helpline at 1-800-272-3900. Bill Hinrichs, associate director of programs and services diversity, inclusion & advocacy initiatives, Alzheimer’s Association Northeastern New York, 4 Pine West Plaza, Suite 405, Albany, N.Y. 12205. For more information, please call (518) 867-4999.